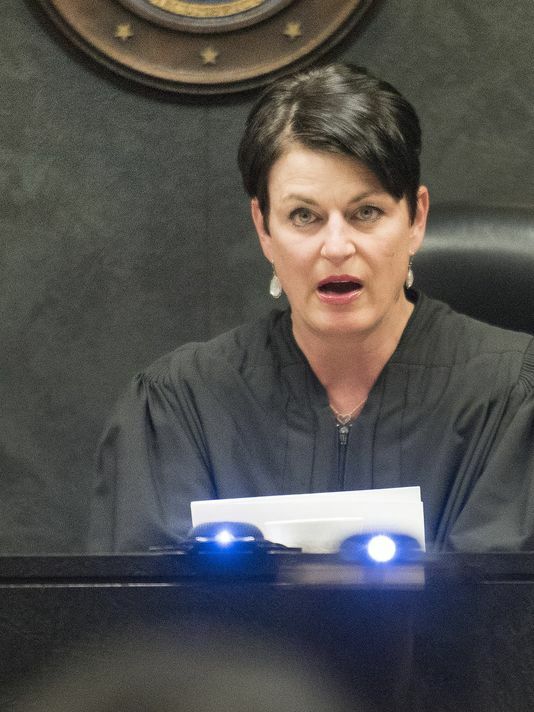 Judge Lisa Gorcyca sentenced three children to a juvenile detention facility and had them handcuffed and led out of her courtroom after they refused to spend time with their father. 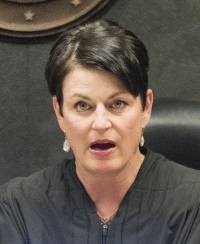 Oakland County Circuit Judge Lisa Gorcyca lost a bid Friday to derail a Michigan Judicial Tenure Commission trial against her next week on charges of misconduct in her handling of a contentious custody case in which she ordered three children locked up in juvenile detention. Gorcyca had sought to have JTC Executive Director Paul Fischer disqualified on the basis of “prosecutorial misconduct.” But former Wayne County Circuit Judge Daniel Ryan, who was appointed as a “master” to hear the JTC’s case against Gorcyca, denied the motion to disqualify Fischer and JTC staff member Margaret N. S. Rynier as examiners in the case. The tenure trial on two related misconduct complaints against Gorcyca is set to begin Tuesday before Ryan in Plymouth District Court. If judicial misconduct is found as a result of the JTC trial, the matter will be referred to the Michigan Supreme Court for possible disciplinary action. “Respondent (Gorcyca) wants a do-over, except you don’t get a do-over,” said Rynier. The two-count JTC complaint against Gorcyca, filed in December, centers on Gorcyca’s behavior on June 24, 2015, when she sentenced three children to a juvenile detention facility and had them handcuffed and led out of her courtroom after they refused to spend time with their father, an action that drew international media attention. Her decision was part of a long-standing custody battle over the three children of Omer Tsimhoni and Maya Eibschitz-Tsimhoni, who divorced in 2011. The children’s father contends his ex-wife has been guilty of “parental alienation,” a pattern of behavior where one parent sabotages the children’s relationship with the other parent. Eibschitz-Tsimhoni claims the children did not want to see their father because he was abusive, an accusation Tsimhoni denies. The first count of the JTC complaint focuses on Gorcyca’s alleged misconduct, stating that she spoke to the children with anger and sarcasm and that she misrepresented facts by telling the children they would be housed in jail cells and potentially incarcerated until they turned 18. During that proceeding, according to the complaint, the judge compared the children, who were ages 14, 11 and 9, to members of Charles Manson’s cult, saying they had been brainwashed by their mother against their father. The second count of the complaint accused Gorcyca of making false statements in her written response to the JTC, including denying that she found the children in contempt of court. At Friday's hearing, Ryan also denied a second motion by Gorcyca to eliminate exhibits and testimony about events that occurred after June 24, along with a motion filed by the JTC to disallow a deposition by Susan Lichterman, one of Omer Tsimhoni’s attorneys. He granted another motion by the JTC to strike a list of expert witnesses that Gorcyca’s legal team had intended to call. After the JTC complaint was filed in December, Gorcyca recused herself from the Tshimhoni case, which was then transferred to Oakland County Judge Joan Young. The children are currently splitting their time between both parents, pending a custody hearing scheduled to begin June 23.